If a recipe has the word “Mediterranean” in it, I will probably love it. The funny thing is, I know that strictly speaking, there’s no such thing as “Mediterranean food”. There are over twenty countries on the Mediterranean sea, each one with its own unique cuisine. You have Italian, Spanish, French and Greek (which are probably the first countries to come to mind for most people), but you also have Moroccan, Egyptian, Lebanese, Turkish and Israeli, among several others. Mediterranean food could be a heaping plate of spaghetti, but it could just as easily be falafel or couscous or something I’ve never even heard of but would love to try some day! Still though, there are some common elements and when I hear “Mediterranean food”, I expect some combination of fresh fruit and vegetables, olives, tomatoes, herbs, spices, nuts and beans, grains, fragrant aromas and rich sauces. There is likely to be lots of olive oil involved. It will probably smell very good, and there is a real possibility that I will want seconds, and maybe thirds. I think what people really mean when they say “Mediterranean” is something along the lines of “fresh and delicious”. So anyway, in the spirit of appreciating fresh and delicious food from no specific place, here’s a quick and easy summertime dinner for you. 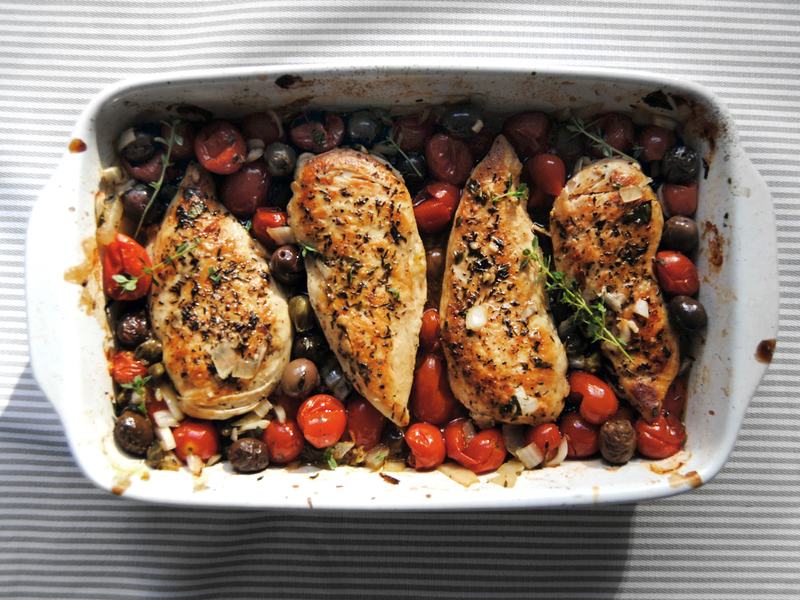 Let’s call it Mediterranean Chicken, because we can. After all, it fits the criteria. I made this for the first time about two weeks ago and it was so good that I just had to have it again this weekend. It’s so quick and easy to make – less than an hour from start to finish, and half of that time you can spend on your sofa, or in the backyard reading a book. The result of all your efforts? 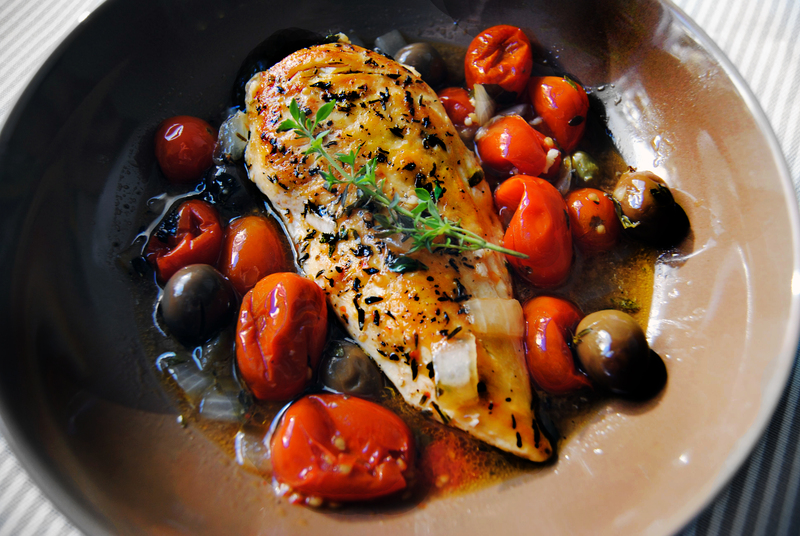 A perfectly cooked chicken breast in a sauce that seems too good to be true. After the first bite, you will ask yourself “How did this sauce just happen while I was sitting on my couch?” and then look around for the kitchen elves who must have added something to the pan while you weren’t looking. You might even forgive them for messing up that last batch of brownies… pesky little elves. This is a wonderful dinner to share but it’s also perfect for one if you’re cooking just for yourself, so you don’t want to spend hours in the kitchen but you still want something special. 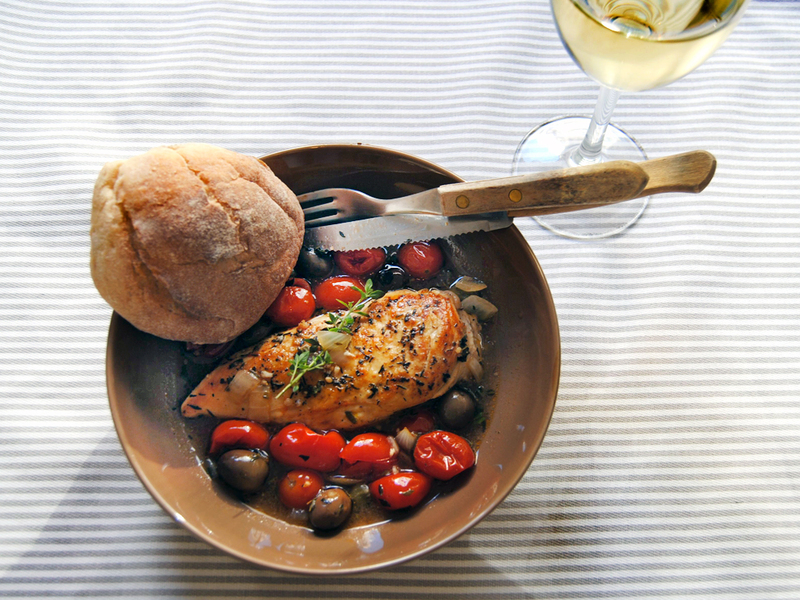 Just make one chicken breast instead of four, or make two and have leftovers for lunch tomorrow! It’s also simple enough that it’s good for a Monday night dinner, but classy enough that you can make it on a special occasion. Who are we kidding… Monday night is a special occasion. This is one of those recipes that is very open to interpretation. You can try it with different herbs, or throw in more vegetables, or maybe add some spice? I think a few red pepper flakes would be awesome in this dish! A splash of wine couldn’t hurt, either. Some lemon? Marinate the chicken for a few hours beforehand? Oh, you’re killing me! Note: Be very careful with the amount of salt that you put in this dish. A little is fine but remember that olives and capers are very salty as it is! Preheat the oven to 350ºF/180ºC. Season chicken with salt and pepper and any herbs you feel like adding. You can also pound the chicken so that it is uniformly thick, but remember that it will be swimming in delicious sauce, so if there are some dry bits you will hardly notice. Heat about 2 tablespoons olive oil in a large skillet and when the oil is very hot, fry the chicken breasts until they are golden brown on each side (but not cooked through). Set aside in the pan you will use for roasting. In a large boil, mix together tomatoes, olives, onion and capers. If you want to, add a spoonful or so of the juice from the capers and/or olives. Yum! Season the mixture with a dash of salt, pepper and the fresh herbs and drizzle with the remaining 4 tablespoons of olive oil. Mix it all up and maybe nibble on an olive or two. It’s allowed. Pour mixture over the chicken breasts. Roast for 20-25 minutes or until the chicken is cooked through. Be careful not to overcook the chicken, as it can easily dry out. Serve with brown rice or warm, crusty bread to soak up all the delicious juices. If you’re an aspiring blogger like yours truly, you can heat up some bread in the oven while you take pictures of your food and by the time you get a picture that is just right, the bread will be nice and toasty and ready for dipping. You also probably want to have a glass of white wine with this, because it’s summertime. Just made this! So delicious! !